I love poring over hotel review websites, destination guidebooks, and travel chat boards to plan out every detail of upcoming vacations. This time, however, I had to wing it. My son’s bout of chicken pox delayed our trip and forced me to revise the itinerary. Instead of our carefully planned to visit to the East Coast, our family of four flew to San Francisco at the last minute. Type-A traveler that I am, I worried that a getaway without structure would result in cranky kids and grumpy grown-ups rather than rest and relaxation. Our trip was filled with some fun surprises. Check out my tips for spending four days in San Francisco with kids. 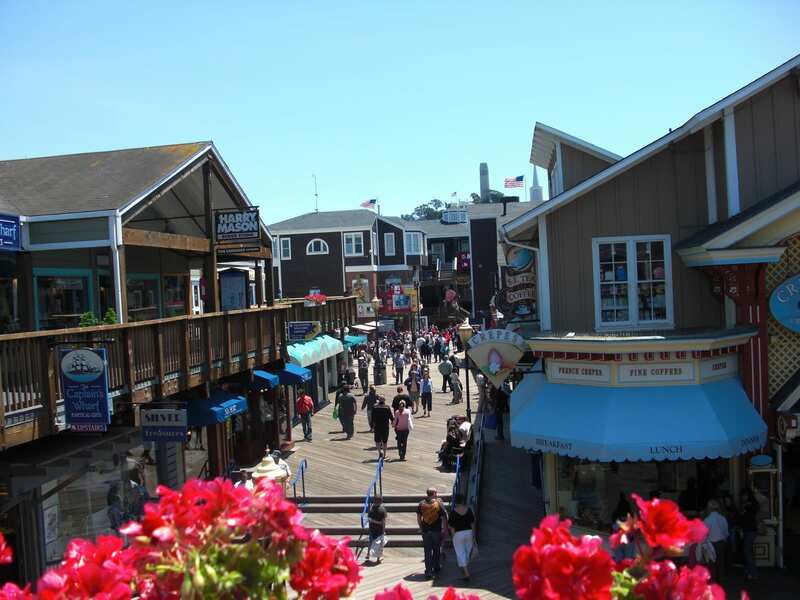 After settling in to our hotel, we walked to Pier 39, a mecca of shopping, dining, and entertainment perched over the bay. The plan was to eat at Bubba Gump Shrimp Co. because our children’s screeching would go unnoticed in the themed restaurant. Alas, there was a line out the door of other families thinking the same thing. Instead, we went to Pier Market, a seafood restaurant with a view of the boats bobbing in the harbor. The most memorable part of the meal was the warm sour dough bread – tangy, crispy, and chewy in all the right ways. I had the grilled swordfish with lemon garlic butter, which was adequate but bland. My husband got a crab melt – I’m still not sure what possessed him to order such a thing but it was good if you dig creamy, cheesy, messy sandwiches. An affordable kids menu is available with standard options. The next day we headed back to Pier 39. We watched the sea lions barking and flopping about for a while. Then we happened upon a juggling show, which I was “volunteered” to join. You would think my preschooler would find it cool to see Mommy on stage, but noooo, she cried the whole time. Apparently, she was jealous that I was picked instead of her. After that we took the kids for a spin on the double-decker carousel. My children are good on-the-go sleepers so at naptime the baby dozed on his daddy’s shoulder while Karissa curled up in the stroller. When Leo woke before his big sister, I took him to the Aquarium of the Bay. I have seen my fair share of aquariums and for the price, this one can be skipped. The moving walkways were broken, the exhibits were not well lit, and while there certainly were fish, I didn’t see anything spectacular. If you must go, look for employees in the center of the pier handing out coupons for discounts on tickets. Kids under age 3 are free. If you need a stroller in a pinch, check out Perrykids, a clothing store at Pier 39 that sells adorable handmade sweaters from Peru and rents strollers for half-day and full-day use. Late in the afternoon we texted San Francisco friends for recommendations on good Chinatown eats. Two families pointed us to the same restaurant: House of Nanking. The Sizzling Rice Soup, with its lemon-scented broth filled with vegetables and crispy rice, was worth the 40-minute walk from the pier. The lightly tempura-battered Salt and Pepper Shrimp with Mushrooms was divine, but the Famous Nanking Sesame Chicken was fatty and not worthy of its name. We all got a kick out my Hot Blossoming Flower Tea. What started as an innocuous green ball of leaves opened into a lovely pink bouquet floating in my glass. There is no kids’ menu but you can order thick round chow mein noodles without sauce, vegetables or meat for picky eaters. After our early dinner we meandered through Chinatown on our way back to the hotel. Karissa loved the exotic shops filled with plastic golden cats and dragons carved of jade. I bought Karissa a pair of red embroidered satin shoes for a few dollars. She still adores her “fancy” shoes, which she delights in pointing out to friends and strangers alike. I also treated myself to a Japanese puzzle box to add to my box collection from my travels. Since our toddler son was still napping twice a day, we took a long drive to induce his morning nap. 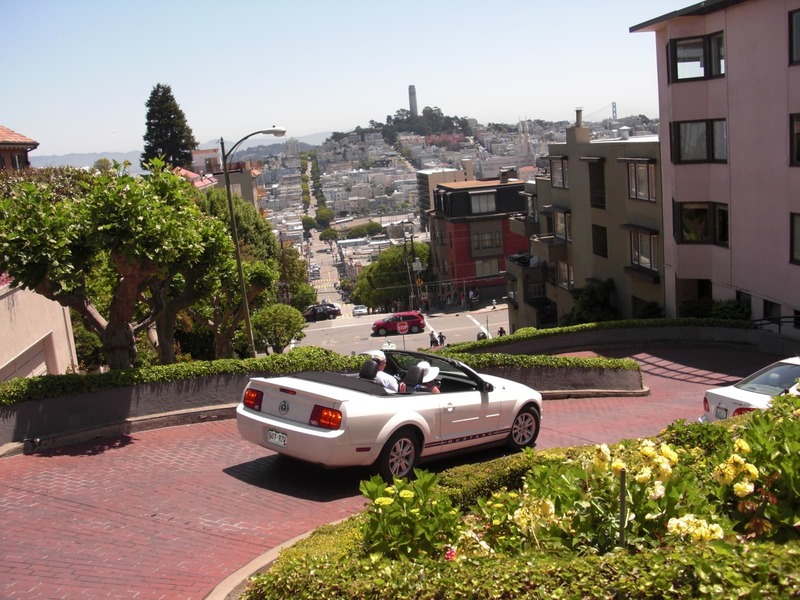 We drove around for some time searching for Lombard Street, the crookedest street in the world. After two jaunts down the winding road we stopped for lunch at Mel’s Drive-In. The food was mediocre; I didn’t even finish my watery vanilla shake (a sin for a dessert lover like me!). 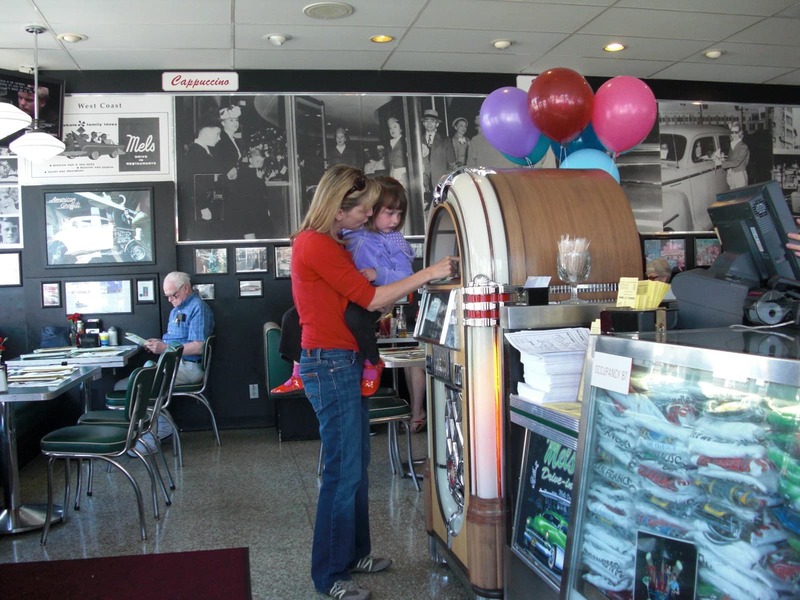 However, the kids enjoyed the free balloons and jukebox stocked with doo-wop songs. My daughter was impressed when her chicken nuggets drove onto the table in yellow car made of paper. Next we headed to the Golden Gate Park. Covering over 1,000 acres, it is even bigger than New York’s Central Park. In fact, it may be too big. There are numerous attractions, like the Academy of Sciences natural history museum, the Conservatory of Flowers, and the Buffalo Paddock where you can view American Bison. However, everything is so far spread that you can only plan to hit one, maybe two sites in a single day. The park lacked sufficient signage so I purchased a map for a couple of bucks from a little hut that sold post cards and the like. We were stopped frequently by other visitors who wanted to take a peek at the map so they could figure out where the heck they were in the massive park. After a long walk from the underground parking garage, we finally caught a glimpse of the Children’s Playground. My daughter shouted, “Mommy! That’s the biggest playground I ever saw in my whole life!” She took off running and joined up with the other children working industriously together on an assembly line of fun in a stream of water that ran through the sand. 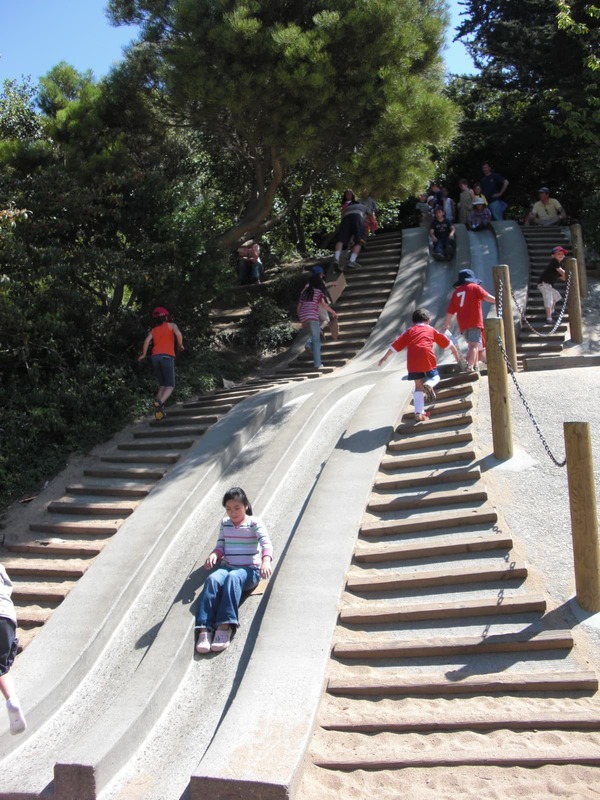 Young children played on standard slides, swings, and climbing structures while older kids slid on torn pieces of cardboard down a two-story cement slide built into a hill. Again we texted San Fran acquaintances, this time to inquire about Italian food. We took their advice and headed to Mona Lisa in Little Italy. It was a fabulous spot for families: busy, noisy, with lots of colorful eye candy. It’s the kind of place where waiters coo, “Bello bambino!” at your toddler, and the tables are squished together creating forced camaraderie with neighboring diners. On our last morning we walked along the harbor to Ghirardelli Square, named for the chocolate factory that was once located on the site. Today there is a Ghirardelli’s Ice Cream and Chocolate Shop, which doles out free chocolate samples at the door. You can indulge in gooey sundaes or stock up on cable-car-shaped tins filled with treats as souvenirs. You can also view a few original machines stirring up vats of chocolate and read the signs about how chocolate is made aloud to your kids, if they’ll listen. My husband noticed Karissa and I gazing longingly at the darling, pinkety-pink Crown & Crumpet Tea Salon. He suggested she and I have a mommy-daughter tea while he and Leo grabbed lunch at the diner also located in the square. Karissa was served the Nursery Tea, which came with three tea sandwiches (cucumber, PB&J, and egg salad), a scrumptious scone with clotted cream and jam, and four mini sweets as well as hot or cold tea. I opted for a slice of quiche Lorraine served with a green salad. Karissa spent the meal fishing the colored heart and star sugar shapes out of the sugar bowl with which to overload her cup of fruity tea. It was a lovely, sweet ending to our long weekend away. I always say planning is half the fun (and the battle!) of any trip. But not having set plans forced us to experience San Francisco as it unfolded before us and led to fun surprises and impromptu experiences we may have otherwise missed. I wouldn’t change a thing. Do you have any tips or questions about visiting San Francisco with kids? Let us know in the comments below! A Note from The Travel Mama: I did not receive any media discounts related to this trip. All opinions are mine, as always! Thank you so much for all the wonderful advice. My wife and I found it very heplful on our first trip to San Francisco. Great site! I will be forwarding this to all of my family and friends. Just hearing about the treats at Ghirardelli Square made my mouth water and my heart long for SF! Thank you for sending me the link to this post. I love that you shared a place to rent strollers. I don’t feel like bringing one on the plane…not worth it. Thanks for the honest feedback on the restaurants as well. The park looks like fun, oh I can’t wait!!! We leave for SF soon with kids and this post is helpful!